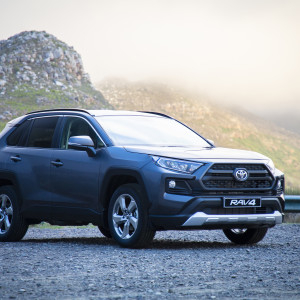 Launched way back in 1994, the year made famous for Nelson Mandela’s ascendancy to the presidency, the Toyota Rav4 was a bit of a radical break away from the norm. Touted as a go anywhere kind of car, with off-road capability and compact looks more akin to a hatch, it certainly got the people talking. 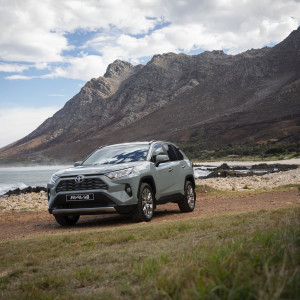 Cue 2019, and the All new Toyota Rav4 in it’s fifth generation, launches in SA. It had to come with a major make-over, as the previous model, albeit, still a decent seller, did not capture the imagination as did it’s predecessors. And this one is back to its roots, the same pioneering spirit is witnessed in the all-new fifth generation RAV4, which takes the SUV into a new era of performance, capability and safety – advances that are underpinned by the first use of TNGA (Toyota New Global) Architecture in a Toyota SUV and a powerful new design. As with the new Corolla hatch, the new Rav4 also is founded from the Toyota new global architecture platform. This gives the car a low centre of gravity, by making every component lighter and placing it lower down on the vehicle. The platform also allows for a 57 per cent increase in body rigidity, which contributes to a stable, flat ride with superior handling. For the customer this makes the car more fun to drive, while at the same time enabling design freedom inside and out, enhanced safety performance that gives greater peace of mind and more comfort for everyone on board. 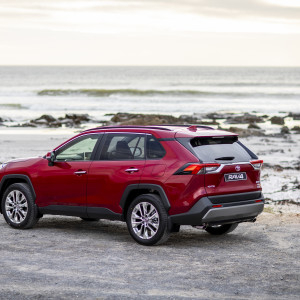 The RAV4’s looks have gone back to being assertive and more modern, with a bold bumper, grille, LED headlights and tail lights creating a broad, athletic build that tapers towards the back to provide an all-round muscular appearance. 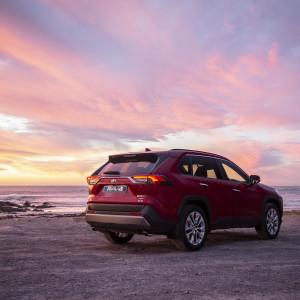 This strong build isn’t just for show, with its increased ground clearance and shorter front and rear overhangs, the all-new RAV4 can take on tough terrain with ease, as well as maximising the available space. The TNGA platform gives the Rav4 better all round visibility and the rear view is also much improved. I like the new looks and they bring back some much needed modernity, and just generally more in line with it’s opposition, without which, it would fall behind. The cabin is given a more premium feel by the soft touch materials used, and the dash and side panels have a softer touch as well.Brushed aluminium trim adds another level. The dash is low-set and adds width to the interior, and storage spaces are at a premium as well. The platform is slightly shorter by 5mm, but the cabin is larger by 30mm. The steering wheel and controls for positioning seat to pedal etc are great and space within the front and rear is optimized. Seats have a 60:40 fold down option for added room, and it boasts of being able to fit a mountain bike in the rear without having any wheels removed. A power operated tail-gate is a huge benefit. 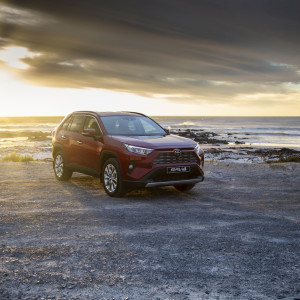 The new RAV4 is offered with a choice of two petrol engines, a 2.0-litre or 2.5-litre four-cylinder unit. The ‘Dynamic Force’ engines, both fitted with intelligent variable valve timing, deliver improved performance and a more responsive and fuel-efficient drive. I definitely preferred the 2.5 L engine, as we had less gear down with the CVT gearbox in the 2.0 L, and it delivered enough power & torque. The 2.5L is mated with a 8-speed Sport Direct Shift transmission, which offers smooth and crisp shifts and lock-up control when in Sport mode. The 2.0-litre engine delivers a maximum power output of 127 kW @ 6600 rpm and peak torque of 203 Nm between 4400 and 4800 rpm, while also offering a fuel consumption of between 6.5 – 6.8 l/100km and C02 emissions as low as 147 g/km. The flagship 2.5-litre engine produces 152 kW of power at 6600 rpm, and peak torque of 243 Nm between 4000 and 5000 rpm, while offering fuel consumption of 7.3 l/100km and C02 emissions as low as 166 g/km. It is mated with a CVT gearbox including an increase to 10 pre-programmed steps (up from 7) and fixed first gear to facilitate crisper start-off acceleration. The 6 speed manual is also good and gives good rev range. 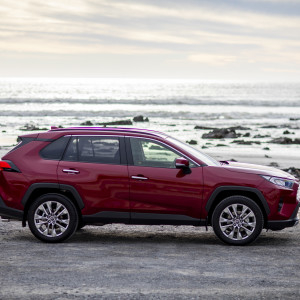 Toyota is introducing improvements in the all-wheel drive technology in the new RAV4 to deliver enhanced performance, capabilities and control in all driving conditions. The mechanical all-wheel-drive system is equipped with Toyota’s first dynamic torque vectoring system with Rear Driveline Disconnect. This manages torque distribution between the left and right rear wheels using twin couplings on the rear axle to give stable performance and accurate response to the driver’s steering inputs when cornering, both in dry and slippery conditions. I found that driving on dirt roads, that were fairly slippery, it was a doddle due to the grip of the AWD. 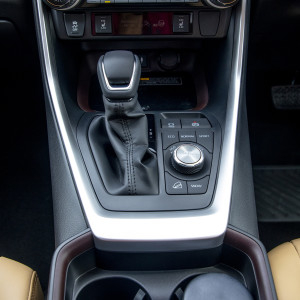 The new RAV4’s AWD performance is further improved with the introduction of AWD Integrated Management (AIM), a unique feature in its class. This automatically adjusts different vehicle systems – steering assist, brake and throttle control, shift pattern and drive torque distribution – according to the drive mode selected. ‘Mud & Sand’ and ‘Rock & Dirt’ modes are available. For the first time the RAV4 line-up will comprise a three-grade strategy – GX, GX-R and VX. The GX and VX grades are familiar to current owners whilst the newly added GX-R ushers in a new ‘edgier’ kind of RAV4. The GX model forms the foundation and offers 17-inch alloy wheels, roof rails, LED headlights, push-button start, a seven-inch display audio and multi-information display (MID), Cruise Control, Reverse Camera and rear Park Distance Control (PDC) are also included. The new GX-R grade is aimed at customers looking for a more rugged exterior appearance and increased off-road usage. The GX-R receives an enlarged upper front grille with broad horizontal slats, a larger more prominent skidplate and chunky black over-fenders. In terms of specification, it bridges the gap between the entry GX- and flagship VX-grades by adding power-adjustable leather seats with lumbar support, seat heaters, leather steering wheel and trim, smart entry, auto-dimming interior mirror, rain-sensing wipers, wireless charging and climate control. The exterior inherits 18-inch alloy wheels to match the visual differentiation. Seat heating and ventilation are provided for front passengers. The range-topping VX is further augmented by 19-inch high-gloss alloy wheels, Auto High Beam (AHB), Blind Spot Monitor with Rear Cross Traffic Alert, memory seats, power-operated tailgate, Panoramic View Monitor plus front PDC. This was definitely my favourite being more mature, and it would be on my buy list. Befitting Toyota’s occupant safety ethos, the new RAV4 is equipped with a raft of safety features. A full suite of Airbags – including knee and curtain types – are fitted to all models, with electronic driver aids in the form of ABS, EBD, Brake Assist, Vehicle Stability Control (VSC), Hill Assist Control (HAC) and Trailer Sway Control all catered for. 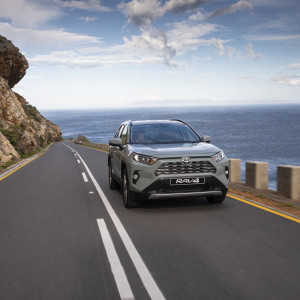 The VX model introduces Toyota Safety Sense for the first time on RAV4, which encompasses Adaptive Cruise Control (ACC), Lane Departure Alert (LDA) with Steering Control, Blind-Spot Monitor (BSM) and Pre-Crash System (PCS). The Adaptive Cruise Control and LDA systems thereby lend a level of autonomous driving to the VX models by offering steering assist as well as radar-controlled braking in conjunction with acceleration functions. With the expansion to a three-grade strategy the model-line up has also been broadened. The GX grade is offered in manual and CVT variants (both front-wheel drive), the new GX-R grade exclusively in 2.0-litre CVT all-wheel drive format and finally both 2.0-litre CVT front-wheel drive and 2.5 8AT all-wheel drive are available in VX guise. In summing up, I enjoyed driving all models, but for me, the money would only be spent on the range topping VX 2.5 8AT AWD. It offers everything I would want, and the price tag is pretty good. The other models will also find willing buyers.